The ErrorProvider alerts the user that something is wrong. In this example I will use a Display Warning icon, Wrong icon (when an incorrect expression is entered ) or a Tick icon depending upon the data entered in the text box so that the user can determine that data entered is correct or incorrect. 1. Create a new Windows Forms Application. 2. Place two text boxes (for getting name and age) and three ErrorProvider controls from the toolbox. Set text boxes are named txt_name and txt_age. I have also created a button but there is no use for it (in the example). 3. 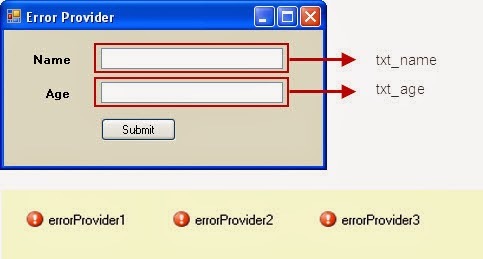 Set the Icon for errorprovider1 (warning), errorprovider2 (wrong or cross) and errorprovider3 as a tick mark (for a correct entry). I will use the warning errorprovider when the user leaves a text box blank, use a cross or wrong when the user enters incorrect informat (for the Age text box) and a tick icon for when all conditions are satisfied. 5. Now we need to create validating events for both text boxes. Right-click on the TextBox then click on "Properties".then click on the lightening bolt (Events) icon at the top of the window, then double-click on validating event. 6. Enter these codes between the generated codes. In the "txt_nameValidating()" event, if txt_name is left empty then it shows error. This is done using the "setError()" method. The setError method sets the error description string for the specified control. If the user hovers the mouse over the error icon then it shows an error description string that we have declared in the setError() method. 7. Build and run the code. You can also download the source code of this example.